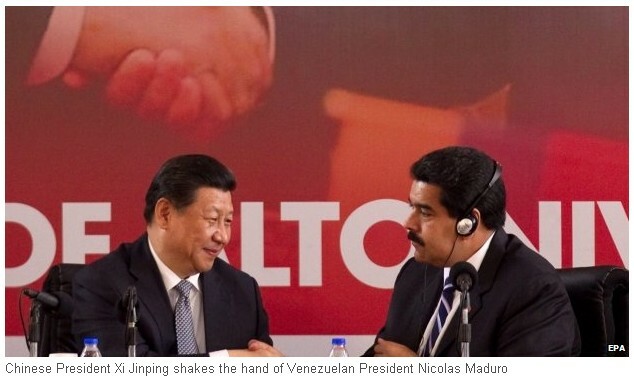 Chinese President Xi Jinping has signed a series of oil and mineral deals with Venezuela. They include a $4bn (￡2.34bn) credit line in return for Venezuelan crude and other products. The agreements came on the latest stop of a four-country visit to Latin America. Mr Xi has already signed key deals in Argentina and Brazil. He has now departed from Venezuela and will visit Cuba next. In Argentina the Chinese leader agreed to an $11bn currency swap providing much needed money for the government of President Cristina Fernandez de Kirchner. Argentina has been locked out of the international capital markets since a default in 2001. Mr Xi also helped launch a new development bank alongside the other emerging powers of the Brics group - Brazil, Russia, India and South Africa - at a summit in Brazil. The new bank is intended to create an alternative to the Western-dominated World Bank. Chinese trade with Latin America has grown rapidly. It is now the second-largest trading partner in Argentina and Cuba, and has been Brazil's largest since 2009. China is the second-largest market for Venezuelan oil after the United States. Analysts say the underlying purpose of the visit has been to secure more natural resources from Latin American countries to fuel China's long term economic expansion. The Chinese president is now on his way to Cuba where he will meet President Raul Castro. The Communist-led island and China are long-term close political allies and China has given Cuba generous trade credits in the past.